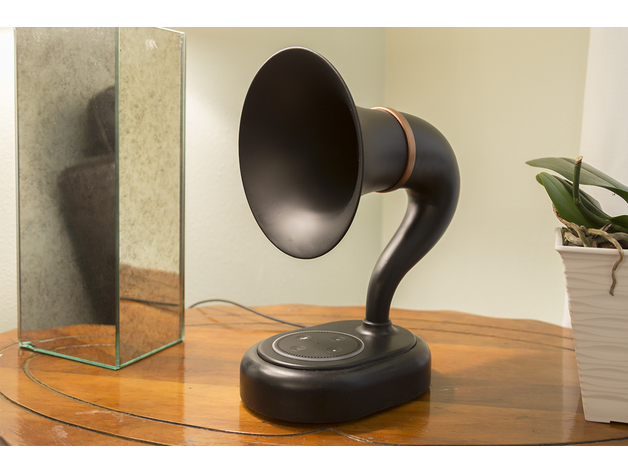 Add a Vintage-Style Gramophone Speaker to Your Amazon Echo for Acoustic Amplification | #3DPrinting « Adafruit Industries – Makers, hackers, artists, designers and engineers! I have always loved the look of the old radio horns of the 20’s and 30’s, but sadly, acquiring them is becoming harder and harder these days, and when you do come across one, the price is usually very high. There are reproductions on the market in the form of standalone bluetooth speakers, but these are usually sold at an even higher price point than the originals. I had almost given up on the idea of getting one of these until I had the aha-moment so many of us makers have at some point. I realized “Hey, I have a 3d printer, so why not just make one?” and so off I went to Fusion 360 to see what I could slap together. Initially I was just going to make the horn part, and make a wooden base for it to house some electronics for a Bluetooth receiver and speaker, however, looking at my Echo Dot sitting at the corner of my desk, a light-bulb went off and the idea for the Gamazon was born!